Public Comment Deadline is June 22, 2018 (midnight postmark). Send comments by email to Janette Hansen at EPA, Hansen.janette@epa.gov, or by mail postmarked not later than midnight June 22, 2018 to: Janette Hansen, U.S. EPA, Water Division, UIC Branch (WU-16J), 77 Jackson Blvd, Chicago, IL 60604-3590. Put “Grove #13-11 well, draft permit number MI-051-2D-0031 in the subject line. 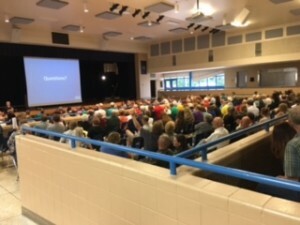 Over 200 people packed a public hearing and meeting held by the US Environmental Protection Agency in Gladwin on June 19 at Gladwin High School to find out about and give public comment on a proposed injection well for Sage Township. The injection well permit sought by Jordan Development LLC would convert an existing gas well into a disposal well that would service two nearby oil and gas wells by a pipeline, and allow the company to dispose of 20,000 barrels of oil and gas wastes daily, indefinitely. Attendees were frustrated to learn that a proposed pipeline to carry the toxic waste (repeatedly called “water” by the Jordan Development representative) from the wells to the injection well, while just 3 feet underground, was not a part of the EPA’s authority, and could not be part of the EPA decision. Residents continually pointed out how little information was really revealed by the draft permit or the EPA spokespeople. When asked what chemicals were in the benign-sounding “brine,” EPA’s Janette Hansen replied “It’ll be a long list.” The “area of review” for an injection well is only 1/4 mile, while residents clearly were concerned about impacts beyond that short distance. Numerous residents from Gladwin County and neighboring counties got up to the mic to ask questions during the public meeting, and to make statements during the hearing. 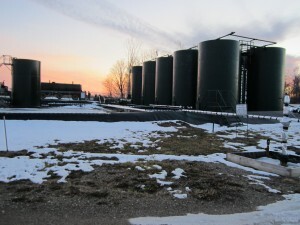 Teachers, scientists, doctors and other residents were of one mind and against the permitting of the well, citing potential health risks, water contamination, interference with old abandoned wells in the area, and the seepage of the waste in the permeable underground formations that might find its way far from Gladwin county. A long time resident brought in some of his well water and poured some glasses for the EPA staffers to see. His water became salty 22 years ago and he still doesn’t drink it. “Think about the children,” he said, and warned the staffers to not drink it. One young woman resident, bald and wearing a breathing mask, after telling her story of being in stage 4 cancer after having breathed the vapors in the area, warned residents of the harmful air toxins that would come from oil and gas waste. She received a standing ovation. One resident prefaced his comments by saying he was born and raised on the Cedar River and got his masters degree in fisheries and wildlife. As a scientist, he said he was concerned about the well failure rates and pointed out the hundreds of leaks nationwide. Letha Raymond from Clare County voiced her concerns about the health and safety of area residents and the effects of injecting oil and gas wastes in an injection well with so many old oil and gas wells in the area that are not capped. Amy Kruske pointed out that a letter to the editor and residents’ requests for a hearing was what alerted residents to the proposed injection well and led to the hearing. Ellis Boal and LuAnne Kozma, representing Ban Michigan Fracking, attended and gave comments regarding seismicity and well casing failure. Residents are urged to submit public comments concerning the process, geologic siting, well engineering, and operation and monitoring standards. Kozma noted that the EPA was asked the question a year ago at a similar public hearing for an injection well in Barry County: “What is Michigan’s well casing failure rate?” and the EPA said it did not know. At this meeting in Gladwin, a resident asked the same thing and the answer was the same: They do not know. Kozma requested a new public hearing and urged residents to do the same. Kozma, Boal, and other Committee to Ban Fracking in Michigan volunteers were there with information sheets about fracking and frack wastes, and collected over 210 signatures on the statewide ballot initiative petition that night. FOR MORE INFORMATION ABOUT THE PROPOSED INJECTION WELL: The fact sheet and draft permit are available on the EPA website here. Weber 4-8, waste injection well in Mayfield Township, Grand Traverse County. Michigan’s Department of Environmental Qualify (DEQ) is proposing new administrative rules which will allow it to be the prime regulator of injection wells in the state. Send your comments about this to DEQ by 5:00 pm on March 16. Here is a template for requesting a 30-day extension of the comment period. Even as DEQ staff in 2014 incurred multiple felony charges in the Flint water crises, it was beginning a process of seeking “primacy” from the federal Environmental Protection Agency (EPA) over regulation of oil-gas injection wells. 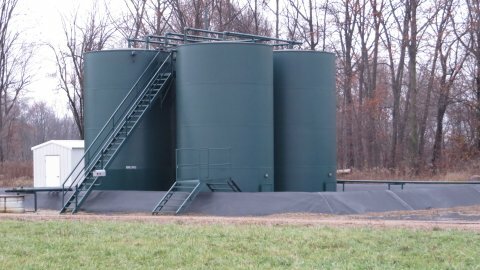 These wells, called “class II injection wells,” are reverse wells, in which operators pour liquids or gas into the earth — for toxic waste disposal, storage, or enhancement of oil-gas extraction — instead of taking product out and selling it. The injected wastes include flowback of the fracturing/acidizing slurry used to complete oil-gas wells, as well as salty brines originally below ground which come to the surface during oil-gas extraction. These liquid wastes are sometimes radioactive. 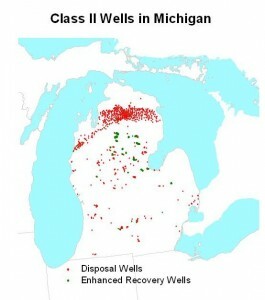 Michigan has about 1300 class II injection wells. DEQ expects this number to increase. At present, the regulatory matrix in Michigan requires that both DEQ and EPA sign off on new class II permits. But unlike Michigan, 34 states have primacy for class II wells. Like Michigan, Pennsylvania and New York have significant oil-gas reserves, but don’t have primacy. Michigan doesn’t need it either. Under the federal Safe Drinking Water Act, Michigan could have sought primacy 35 years ago, when most other oil-gas producing states sought it and got it. But Michigan once had a long-time concern for groundwater protection. Injection wells are an important issue. As we reported in 2016, they leak, eventually most wells fail, and in 10 to 100 years from now we will find most groundwater in the US is polluted. This is particularly noticeable given the increased number of wells recently which use fracturing completion methods. The State of Michigan is well equipped for Class II … primacy, understanding state specific geography, geology, cultural, climactic [sic], social, and economic issues. … The State of Michigan’s record of accomplishment for excellent environmental protection and regulation for Class II injection will continue…. A month later it held a “public hearing,” illegally with no advance public notice that a record would be made and public comments accepted. Only two people from the public showed up, one representing BMF. For our part, we noted DEQ had advanced no reason for primacy other than that it wanted the power. certain DEQ rules place a high documentation burden on people who want to petition for a hearing. But before it could even consider primacy, EPA added, DEQ would have to upgrade its formal administrative rules, a process which involves a for-real public hearing, and can take a year or more. The same year Kentucky sought primacy and EPA granted it. Unbowed, DEQ drafted new administrative rules last December. Its 8-member Oil and Gas Advisory Committee — of which 6 members represent industry — helped develop the draft. Importantly, the primacy-related injection well changes “do not go beyond” current federal requirements. Thus there is no requirement that an injection well test and identify waste before it goes down the hole. The text of the current rules is here. The text of the proposed revision is here. The regulatory impact statement/cost-benefit analysis is here. Injection wells are essential to the future of Michigan oil and gas production for disposal of waste fluids and for recovery projects in existing oil fields. Having a single regulatory structure protective of underground sources of drinking water will have a positive impact on oil and gas development and will reduce the cost of regulatory compliance by elimination of duplicative regulations. The proposed rule set … will … position Michigan to eliminate dual regulation by obtaining primacy. In other words the new rules would simply bring state standards up to the level of the federal standards which are already in place. So if the standards will remain the same, will there be any benefit from DEQ primacy? Yes but only for industry. DEQ held a public hearing on the revisions in Lansing on February 28. A transcript was produced. Eight industry leaders attended and spoke, including Bill Myler Jr. and Robert Long, both members of Oil and Gas Advisory Committee which helped write the draft, and James R. Neal, a longtime outspoken advocate of compulsory pooling. Dave Farner of Dart Oil and Gas claimed that 43 states have primacy. Term-limits should be imposed on injection wells. Otherwise at some point there will be an earthquake. Much of the injectate will travel underground two miles or more. Yet the DEQ area of review covers only a ¼-mile radius. A Richter 4.2 earthquake such as Michigan had in 2015 can affect strata up to two miles away. MCWC once sent DEQ data on 115 old well bores in the area where an injection well was being proposed, but it didn’t matter. Waste should be tested and identified before it goes in the ground. There are no maps for flow or transfer lines from existing contiguous operations. Injection wells are serviced by secondary contracted LLC companies which are unbonded. For oil-gas enhancement, only brine should be allowed not fresh water. The comment period should be extended beyond the current end-date of March 16. MCWC will be following up with written comments. As seen, when it comes to injection EPA already has a low opinion of DEQ. An EPA regulation currently requires that injection pressure must be such as to assure it will not “initiate new fractures or propagate existing fractures in the confining zone” and will not cause the “movement” of injection or formation fluids into public water supplies. Nor does it require identification of faults outside the ¼-mile “area of review.” By contrast an EPA regulation rejects a fixed radius, where inappropriate based on operational parameters and local geologic information, in favor of evaluation within a formula-determined “zone of endangering influence” which can be wider than ¼-mile. The safe drinking water act makes no direct reference to seismic issues. And EPA has shown little interest in the topic since SDWA was enacted. The workgroup studied incidents and swarms in North Texas, Central Arkansas, Braxton County West Virginia, and Youngstown Ohio. Additionally an appendix discussed aseismic examples of class II disposal well activity causing long distance pressure influences. There is no evidence DEQ has given any attention whatever to these issues. Indeed, you emphasized on February 28 that DEQ would impose no requirements beyond those already in effect under SWDA. This is wrong-headed. DEQ should do better. Academic and public interest in seismicity has grown since SWDA. See for instance “Warning bells about fracking and earthquakes growing louder“, … reporting on a recent study of 300 hydraulically fractured wells near Fox Creek Alberta….. In light of increasing injection and public interest, why would DEQ wall itself off from seismic issues? True, few faults are known to exist in Michigan. But the same was said of Oklahoma until injection of oil-gas wastewater began in recent years. “New fault line discovered after 5.8 Oklahoma earthquake“…. DEQ should propose a rule related to seismicity, and convene a new public hearing to air the issue. 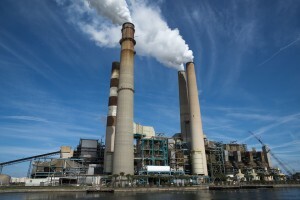 There is growing alarm in Michigan by the increased number of proposed natural gas power plants that will burn natural gas (from fracking) in order to make electricity. If any of these are successful in being built, they doom Michigan to being dependent, for decades upon decades, on more fossil fuels and sustained fracking, and untold amounts of frack wastes endangering the health of future generations. Untold amounts of water used for fracking . . . to find natural gas . . . to burn . . . to make electricity. It’s not sustainable, and it’s not going to save our water or the climate. New plants are planned for Niles, Marshall, Lansing, Fowlerville, and St. Clair. In this first article on the impending natural gas plant invasion, here is one action you can take regarding the plant proposed for St. Clair. Call the Michigan Public Services Commission at 517-284-8330 to leave a public comment about Case #U-18419. Talking points: You’d like to have more jobs and cheaper electricity from wind and solar power plants, protect Michigan’s water from fracking and frack wastes, and have smaller community-based alternative energy. If you are a DTE customer and you don’t want your electricity prices to increase 133% to fund a natural gas plant when wind and solar plant would be cheaper you should call Michigan Public Services Commission. To publicly commit to calling in and to read the notes from others who have already left public comments, go to the group’s call-in sign up sheet here. In 1912 and 1913 a group of local capitalists and businessmen formed the Saginaw Valley Development Company to prospect for oil. During the group’s second attempt, a hole near the geographical center of the city was treated with the downhole discharge of 100 quarts of nitroglycerine. The well “erupted with a spout of oil forty feet high from the mouth of the well and stood solid for four or five minutes. This spurt was followed a few minutes later by a second, higher column of oil that lasted about two minutes and also included natural gas. The excitement in Saginaw was spontaneous.” Predictions were freely expressed that a new era of prosperity was opening for the Valley. … [But the] discovery well, along with eight others nearby, did not pan out commercially. … [Later] a test well was started…. On August 29, 1925, the Saginaw News reported the well’s success with a banner headline. … [I]t was enough oil to be sold commercially. Michigan had arrived as a real oil and gas producing state. This is the story of Michigan’s spectacular entry into oil-gas development in the 1920s, according to a history of the industry collected at Central Michigan University’s Clarke Historical Library. The collection is sponsored by a Michigan Oil & Gas Association (MOGA) affiliate. The Muskegon field followed Saginaw in 1927. At a prime location near a center with a shipping infrastructure by land and water, the field made Muskegon a boom town. Oil crossed the state from Muskegon to a refinery at Zilwaukee. Mount Pleasant, c 1934. Photo courtesy of Clarke Historical Library Central Michigan University. 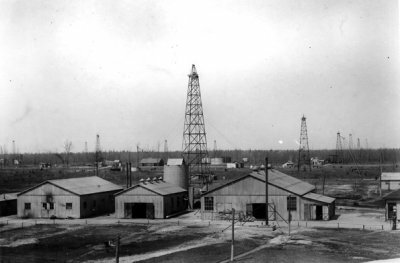 Then according to the collection, in 1928 the new Mount Pleasant field proved the “entire state” had become “Oil Hunting Country.” Mount Pleasant became another boom town, and is the site of MOGA’s headquarters today. In those days discoveries meant gushers that drenched workers in oil, and attracted crowds to celebrate in a carnival atmosphere. Midland County was the site of the state’s biggest disaster in July 1931 when the Struble 1 well exploded killing 10 people including the operator’s wife. No thoughtful observer will presume to gainsay the all-important part which the oil business plays and will continue to play in the industrial, commercial and social life of the civilized world. At the end of [World War I] it was said with much truth that the Allies had floated to victory upon a sea of oil. … Petroleum products are now practically indispensable to the progress of modern industry and commerce. In a somewhat less degree they enter into almost every phase of the daily life of civilized peoples. … No substance now known possesses within itself greater potential capacity to serve mankind. … In these circumstances, pointing as they do to an enormous and ever-increasing demand for the commodity, the question of an adequate supply of crude material reaches the highest importance. … Under pressure of this serious economic condition the petroleum industry must bend its efforts toward the complete exploitation of the lands of the United States for oil. In modern times we know better. It is hardly disputed that oil and natural gas as carbon fuels exacerbate global warming — one of the many aspects of climate change — which can lead to world-wide catastrophe. Even the oil-gas industry, in futile pursuit of carbon sequestration, agrees. But in 1939, taking a cue from James Veasey, Michigan statutory policy began “fostering” the oil-gas industry “most favorably” and “maximizing” oil-gas production. It was an ideology and it serves us poorly. But save for a slight modification in 1973, today it continues to threaten the climate. Of the 30 states which used high-volume production methods, in 2013-14 Michigan ranked 18th in natural gas, 9th in shale gas, and 17th in crude oil. There is little sign that state officials and policymakers have any interest in tamping down production. Last June the governor’s office announced Michigan will not be joining other states in upholding standards of the Paris climate accord. So Michigan is part of the parade marching into a black hole. The future looked so good in the 1920s. How did we get here from there? Every person has the right to drill wells on his own land and take from the pools below all the gas and oil that he may be able to reduce to possession including that coming from land belonging to others, but the right to take and thus to acquire ownership is subject to the reasonable exertion of the power of the State to prevent unnecessary loss, destruction or waste. So it was thought in that period that the tendency of existing law to treat oil and gas the same as stationary substances like coal, encouraged waste of gas pressure even while gas pressure is what drove the oil. It has long been the declared policy of this state to foster conservation of natural resources so that our citizens may continue to enjoy the fruits and profits of those resources. Failure to adopt such a policy in the pioneer days of the state permitted the unwarranted slaughter and removal of magnificent timber abounding in the state, which resulted in an immeasurable loss and waste. In an effort to replace some of this loss, millions of dollars have been spent in reforestation, which could have been saved had the original timber been removed under proper conditions. In past years extensive deposits of oil and gas have been discovered that have added greatly to the natural wealth of the state and if properly conserved can bring added prosperity for many years in the future to our farmers and landowners, as well as to those engaged in the exploration and development of this great natural resource. The interests of the people demand that exploitation and waste of oil and gas be prevented so that the history of the loss of timber may not be repeated. It is accordingly the declared policy of the state to protect the interests of its citizens and landowners from unwarranted waste of gas and oil and to foster the development of the industry along the most favorable conditions and with a view to the ultimate recovery of the maximum production of these natural products. To that end, this part is to be construed liberally to give effect to sound policies of conservation and the prevention of waste and exploitation. As seen from the text, the statute also expresses a second overarching policy, the goal of guarding against “unwarranted waste” of gas and oil. Elsewhere in Act 61 “waste” is prohibited absolutely. Underground waste: practices which dissipate reservoir energy, reduce the total quantity of oil or gas extracted, or damage underground water, brines, or other mineral deposits. Surface waste: drilling of unnecessary wells; unnecessary surface loss of gas or oil; unnecessary damage to surface, soils, animals, fish, aquatic life, or property; unnecessary endangerment of public health, safety, or welfare. Market waste: production in excess of market demand. Contemporary thinking suggests that “aesthetics and environmental values” are positive definable values that should be considered. Today Act 61 is administered by the state’s Department of Environmental Quality (DEQ), alternately referred to as the “Supervisor of Wells” or “Supervisor.” The name has changed over the years, the most well-known predecessors having been the DNR, and “Natural Resources Commission” (NRC). Notably, Act 61’s examples of environmental “surface waste” are all couched in subjective words, “unwarranted,” “unnecessary,” and “other.” That means the environmental part of the policy is dependent on warrant and necessity. But warranted for what? Necessary for what? And just what are the other environmental values? The statute’s only answer: maximizing production and most favorably fostering the oil-gas industry. Particularly the word “unnecessary,” repeated several times in the definition of “surface waste” has no definition, and allows the DEQ wiggle-room. For example, DEQ application forms for a drilling permit ask the dimensions of the surface well site in feet and acres. In practice today, sites cleared of trees in the forest (including the state forest) sometimes range up to five acres. But no statute, administrative rule, or supervisor instruction limits them to that area. Cleared sites in the future could be larger, if DEQ were only to say it would maximize production. As another example, the definition of “surface waste” has no specific reference to air or climate. Nor could it: air and climate are not confined to the surface. The DEQ administrative rules do prohibit “nuisance odors” at and around the wellhead. An example is deadly hydrogen sulfide. Act 61 and the administrative rules do have specific health and environmental provisions. Wells, facilities, and sensitive areas (homes, lakes, streams, protected species) have to be separated by certain isolation distances. Nuisance noises are not tolerated. There are special rules about high-volume fracking. DEQ enforces these. So “Construction of Part” comes down to a mandate that DEQ regulators are to favor the industry unless an environmental issue is tied to what DEQ says is waste. That is, the title “Construction of Part” means that fostering the industry, maximizing oil and gas production, and guarding against waste are construed as overarching guides whenever a judge, jury, or environmental regulator tries conscientiously to apply the sentences and paragraphs of Act 61/Part 615. Act 61 gives the Supervisor of Wells jurisdiction to regulate and control drilling, completion, and operation of oil and gas wells. He/she determines well spacing, acceptable drilling and production operations, proration of the amount of oil or gas that can be taken, forced pooling, who may drill, and environmental measures. From time to time the Supervisor is assisted by an 8-member “Advisory Committee” (formerly “Advisory Board”) of which six are from the Michigan industry and two from the public. Almost unanimously, the legislature passed Act 61 and gave it immediate effect. The governor signed it the same day he received it, giving a cold shoulder to a group of protesting independent oil producers and farm organizations. But none of these developments matched the impact to the industry of the enactment of [Act 61] the first comprehensive oil contol [sic] law. Where in both the 1936 and 1937 Legislative sessions oil bills had died along the way, in 1939 the House approved 79 to 8 and the Senate approved 24 to 3. Gov. Lauren [sic] Dickinson (who succeeded Gov. Frank Fitzgerald who died in office ) signed the oil bill. The birth of the oil act had been long and painful and often bitterly contested. The Association had worked hard for it and most other segments of the industry at least dropped active opposition. 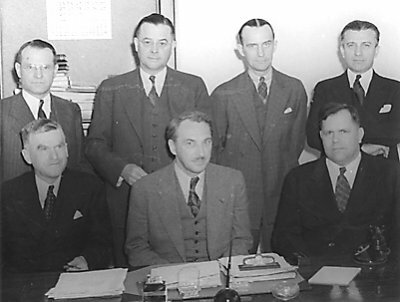 Supervisor P. J. Hoffmaster, a forestry graduate, front center, surrounded by the initial Advisory Board members representing (left to right, front to back) Gulf Refining, Rex Oil, Smith Petroleum, Pure Oil, Gordon Oil, and Socony-Vacuum Oil. Photo courtesy of Clarke Historical Library Central Michigan University. The act was modeled after the New Mexico law and in the minds of many included improved clauses. Dr. R. A. Smith, state geologist, was credited with not only writing many of the provisions but keeping the pressure on for passage from one defeat after another. P. J. Hoffmaster, who had become director of the Department shortly before the law went in effect on May 3, 1939, held the first hearing with the advisory Board … and his first order fixed 10 acres as the base drilling unit and 200 barrels as the maximum production for a well in a prorated field. Party affiliation does not seem to have been a factor in Act 61’s success in 1939 after having failed twice. That year both houses of the legislature were Republican-dominated, but a majority of Democrats in each house also supported it. However Republicans dominated in 1936 when according to MOGA an oil bill died, and Democrats dominated in 1937 when an oil bill also died. In the early days of our development the only statutory requirement was that well owners obtain a drilling permit before operations commenced, that wells be plugged under supervision and that well records be filed with the Geological Survey Division of the Department of Conservation. 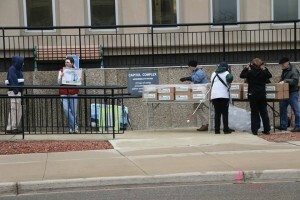 Due to episodes of flagrant waste in the Muskegon field, the oil and gas associations of Michigan and the Geological Survey Division concentrated on efforts to pass adequate legislation on control of oil and gas drilling and production procedures. Finally in 1939 the legislature passed Act 61, P.A. 1939, which, with minor amendments, serves as present authority to prevent waste in the drilling, completion, producing and plugging of wells for oil and gas. … The primary purpose of the statute is to insure that the fewest number of wells are drilled to recover the greatest amount of oil and gas. Always keep in mind the “purpose” set forth in Act 61 of 1939: To conserve natural resources and encourage development of oil and gas. The Supervisor wants you to show that your plans for drilling or development will provide for the orderly development of petroleum reserves and that the most economic means of recovery will be used, which will result in as complete drainage as is possible from the affected pool or field. Despite the infinite variety of relationships devised to accommodate landowners, investors, and operators in oil and gas exploration and development, the underlying motivations in each case are the same: to find and convert dormant natural resources into usable economic wealth and to accomplish this activity with minimum tax and business costs and with minimum risks of litigation. Rapid expansion of military facilities and activities began shortly after passage of [Act 61] and the country was actually at war nineteen months later. Petroleum assumed a critical place in the war economy. It is notable that on very few occasions has the judgment of the Supervisor … failed to agree with recommendations of the [Advisory] Board. For a very short time after the legislation became effective a small segment of the industry, objecting to any measure of production control, offered opposition by deliberate violation of the orders of the Supervisor. Suits against producers of oil and against one pipe line purchaser shortly after the legislation became effective resulted in convictions in Circuit Court. No appeals were made. Few subsequent violations of rules, regulations, or orders of the Supervisor have been deliberate. The purpose of this compact is to conserve oil and gas by the prevention of physical waste thereof from any cause. The Commission shall have the power to recommend the coordination of the exercise of the police powers of the several States within their several jurisdictions to promote the maximum ultimate recovery from the petroleum reserves of said States, and to recommend measures for the maximum ultimate recovery of oil and gas. The Congress declares that it is the continuing policy of the Federal Government in the national interest to foster and encourage private enterprise in (1) the development of economically sound and stable domestic mining, minerals, metal and mineral reclamation industries, [and resource development, research, and waste disposal to lesson adverse impacts]. For the purpose of this section ‘minerals’ shall include all minerals and mineral fuels including oil, gas, coal, oil shale and uranium…. In its fostering role, the federal government is to prevent “unnecessary or undue” degradation of the land. The result of existing legal rules is to force a mad competitive race of owners to extract the oil. Immediate extraction is the price of ownership. Rate of extraction is controlled, not by the rate of consumption or demand, but by the rate of discovery. To save the oil under his own property the surface owner is forced to drill more and more off-set wells in order that he may equal or exceed his neighbor’s production. … [M]arket demand is ignored. … Gas is wasted. Statutes governing the casing and plugging of wells, to prevent water from entering or leaving the bore. Hence, it is said the law, by making it unlawful to allow the gas to escape, made it practically impossible to profitably extract the oil. That is, as the oil could not be taken at a profit by one who made no use of the gas, therefore he must be allowed to waste the gas into the atmosphere, and thus destroy the interest of the other common owners in the reservoir of gas. 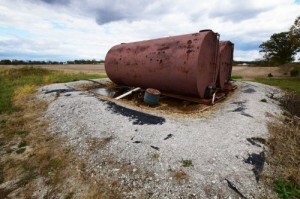 The court recognized the fugacious character of oil and gas, said the many surface owners over the pool other than Ohio Oil have a co-equal right of access to the common supply, and held waste was an injury to all of them. The oil company lost. Statutes to restrict the purposes for which gas may be used. Examples were bans such as Michigan’s on the burning of gas in flambeau lights (torches) and the use of gas in the manufacture of carbon black (a material produced by incomplete combustion of heavy petroleum products). Statutes to regulate the manner of taking, storing, and operation. The earliest legislation in this group made it unlawful to use a pump or other artificial process to increase the flow of natural gas. Ford tells us for instance that Michigan had a regulation forbidding use of vacuum pumps except for casing-head gas or a depleted field, and a statute requiring wells to be located at least 200 feet from outer boundaries. Statutes to “prorate” (or limit) the amount of taking. These were the most controversial. According to Ralls, as a general rule, the more slowly a reservoir is pumped, the more efficiently it is drained. According to today’s DEQ administrative rules, one of proration’s goals is to “maximize oil and gas recovery.” Ford noted the definitions of proration were not nationally uniform. Some statutes (like Michigan’s) limited taking to a percent of the daily natural gas flow. Some limited it according to what was thought to be an optimum oil-gas ratio. Some curtailed production if it was thought to be economically wasteful. Proration so as to secure a fair return to oil producers seems to satisfy the test of a valid exercise of the police power, whether the test be phrased in terms of public interest or of reasonableness. As to the public interest, the industry is monopolistic in its character, and has a tremendous hold upon our economic life. As to its reasonableness, the curtailment legislation falls uniformly on all producers; it stabilizes a great industry; it conserves an exhaustible natural resource. In short, even if curtailment were to be used as a price-fixing device, it should be sustained if the prices fixed were reasonable, as the oil industry seems to be sufficiently affected with a public interest. does not accomplish enough. Proration can only, in a limited degree, give an opportunity for the scientific development of an oil pool. There is no necessary relation between proration (based on market) and the engineering problem of controlling the rate of flow so as to conserve gas energy and control water drive. No mere scheme of proration will curtail excess drilling and eliminate the cost of unnecessary offset wells. Nor will it insure the proper location of the wells on the geologic structure so as to obtain maximum recovery. The solution which promises most in relation to production problems is unit operation. Unit operation means simply that all the properties in a pool shall be consolidated into a single producing unit. Competition in production is entirely avoided and the maximum recovery from the reservoir is secured. Thus according to Ford, unit operation (also known as unitization) would solve the industry’s problems. The distinction between unitization — which is governed by a different part of NREPA, “part 617” — and pooling under Act 61 is not particularly clear. Both can be done either by mutual consent of the interest owners, or can be forced by DEQ. Ralls says unitization “is essentially forced pooling” for certain types of operations. This is a bit oversimplified. The environmental section of the Michigan State Bar explains the nuances here. See also the discussion of compulsory pooling below. The thought is growing that mineral deposits, so slowly accumulated by nature are the heritage of all the people and are not to be exploited exclusively for private gain, or that if the exploitation is left in private hands it must be done in trust for the public. From the public point of view the foremost object should be to obtain the maximum recovery of oil from each pool. There is nothing in the law today that prevents the collective owners from consolidating their interests for the purpose of unit development, except perhaps a fear of the anti-trust laws. And there are splendid examples of cooperative development in the United States. … Unfortunately, these cooperative agreements have been the exception, rather than the rule. The reasons are obvious. The big practical difficulty in the way of such a movement is human greed. So forcing unwilling interest owners into units and pools was considered necessary. None of the reasons advanced for proration, unit development, pooling, or unitization was environmental. True, one environmental result of these was fewer wells and therefore less disruption of the surface. But that was driven by the real motivator, greater production. did not consider it necessary to enact many laws and that those it did adopt are not unduly detailed. The legislature did not desire to over-regulate and thus possibly discourage the development of the infant industry. Michigan statutes were of three types, none of which implicated proration or unit operation. One imposed a severance tax, being a percent of the gross value of the oil and gas which was paid to the state. Another applied to pipeline owners, declaring they were common carriers who could not discriminate among potential customers. The last, thought to “prevent waste and protect the public interests,” provided for a Supervisor of Wells, for inspection where necessary to safety, and for issuance of permits to begin drilling and to abandon wells, and an appeal board. This law was repealed and replaced by Act 61 in 1939. Two Michigan court decisions have rejected industry appeals of permit denials, appeals which argued that the sole purposes of Act 61 and “Construction of Part” were to favor drilling. The court reasoning was different in each case. In Michigan Oil Co v NRC, through intermediaries an operator had acquired from the state a mineral lease for a 40-acre site, Corwith 1-22 located in the Pigeon River Country State Forest, for approximately $2.06/acre. DNR and NRC refused to issue a permit despite a finding that operator actions of clearing the location, bringing in machinery, installations, and personnel, and drilling would have been done carefully and prudently. The Corwith area had many pre-existing public and private uses including camping, snowmobiling, hunting, and timber harvesting. These non-oil-gas activities disturbed elk, bear, and bobcat. But the result of drilling would have been a reduction in their range, habitat, and population. The agencies denied a permit on that basis. We conclude that the construction given to the term waste by the [NRC] … is the correct one and that the very acts of drilling for oil may constitute or result in waste prohibited by [Act 61]. to withhold issuance of a drilling permit to prohibit waste which is unnecessary to the production of oil and gas. The statute, therefore, would impliedly protect any and all other waste, no matter how serious, if necessarily incidental to the production of oil and gas. According to the [oil company], the clear import of [Act 61] was not to conserve the environment in general but to conserve only oil and gas so that they are efficiently extracted. includes any spoilation or destruction of the land, including flora and fauna …. Serious damage to the wildlife of Corwith 1-22 resulting from oil drilling is spoilation or destruction…. Conservation should not be read to apply only to the efficient extraction of oil, but should include the efficient extraction of oil which simultaneously conserves the other natural resources (flora and fauna) of the state. to prevent waste, including serious or unnecessary damage to or destruction or wildlife, even in the absence of specifically promulgated rules and regulations. A concurring justice said simply he would have affirmed the reasoning of Court of Appeals. That made four justices for denial of the permit, albeit with differing rationales. Although use of the surface of the land by the lessee [oil company] results in death and injury to wildlife belonging to the lessor [landowner], such use is not waste within the “ordinary meaning” of that term if it is reasonably necessary for oil and gas operations. A lessee [oil company] does not abuse or misuse the estate granted when it carefully and prudently exercises the rights specifically granted to it. The language in NREPA that deals with oil and gas production seeks a balance between Michigan’s interest in protecting the environment and its interest in harvesting valuable hydrocarbon resources. [Construction of Part does not express], as petitioners argue, a clear public policy favoring drilling. The dissenters in Michigan Oil had given a nod to the environment: they recommended a remand to consider the facts under a separate law, the 1970 Michigan Environmental Protection Act (MEPA). MEPA, which our 1963 constitution required the legislature to enact, protects “air, water, and other natural resources and the public trust in these resources.” Under MEPA courts have overturned DEQ oil-gas permits. But Schmude Oil and the other judges and justices in Michigan Oil reasoned solely from the language of Act 61.
the smallness or shape of a separately owned tract or tracts would … otherwise deprive or tend to deprive the owner of such a tract of the opportunity to recover or receive his or her just and equitable share of the oil or gas and gas energy in the pool. Petition of OIL Energy Corp (Kearney Township Antrim County) was a DEQ pooling decision in 2011. In a 1454-acre unit, owners of 144 acres had declined to lease to the oil company. Assistant Supervisor Harold Fitch gave three reasons for compelling pooling and allowing horizontal drilling under the land of the declining owners. The first reason of course was just and equitable sharing cited in the above-quoted pooling subsection of Act 61. 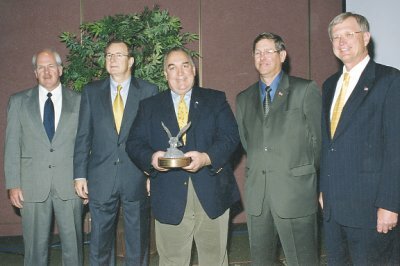 Assistant Supervisor Harold Fitch, MOGA President Frank Mortl, Governor John Engler, MOGA Chairman Greg Fogle, and DEQ Director Russell Harding, on the occasion of IOGCC’s 2002 Environmental Excellence award to the Michigan Natural Resources Trust Fund. Photo courtesy of Clarke Historical Library Central Michigan University. But that subsection does not reference Fitch’s other two reasons: (a) “prevention or minimization of surface waste by fewer surface locations” and (b) “the ultimate recovery of natural gas can be increased and drilling through unleased tracts will assist in avoiding the drilling of unnecessary wells.” The two are inspired by the Schmude Oil view of “Construction of Part,” in seeking to balance protection of the environment and maximization of hydrocarbon resources. With horse pastures, a hay field, a garden and woods on her own property, Armbruster said she enjoyed the farm smells and activities nearby. Cow manure doesn’t bother her, she said, and the rumble of tractors and farm equipment was a comforting sound. The addition of drilling rigs — 24-7 operations for about a month to install a new oil well across the street — and the associated large trucks carrying gravel for new roads — have turned her agricultural haven into an industrial site, Armbruster said. A flare installed at the oil well across the street to burn off natural gas that can’t be captured from the well has also proved to be the biggest nuisance, she said. The smell of gas burning wafts into her home if the wind is blowing from the southwest —causing her to shut her windows and stay indoors. In addition to the gases being released through the flare, Armbruster said she’s concerned for the future safety of her water well in her front yard should drilling activities or spills from crude oil transportation contaminate it. Michigan’s declared policy is to foster the development of its oil and gas natural resources “with a view to the ultimate recovery of the maximum production of these natural products.” Those who want to capture the oil and gas beneath their land are entitled to do so, but their efforts are subject to Michigan’s declared policy and regulatory implementation of that policy. The role of compulsory pooling in this regulatory scheme has been to preserve drilling units. The practice successfully balances the rights of those desiring to develop their oil and gas interests against the wishes of other owners who either oppose development altogether, or who oppose development on economic terms other than their own. Neal conceded that no published Michigan court decisions address the constitutionality of compulsory pooling, but argued it is like zoning. He noted a 5-4 Oklahoma decision, Palmer Oil Corp v Phillips Petroleum Co, which upheld the constitutionality of a pooling statute like Michigan’s, in 1951.
that a greater ultimate recovery of oil and gas may be had [from the unit], waste prevented, and the correlative rights of the owners in a fuller and more beneficial enjoyment of the oil and gas rights protected. The statute allowed a majority of the interest holders to initiate a compulsory pool. The objectors were lessors, lessees, and royalty owners. They made no environmental arguments, such as danger to animal or plant life, water or air quality, or climate. Like Charles O. Galvin, the state of Michigan wrongly assumes that for everyone – landowners, investors, and operators – “the underlying motivations in each case are the same”: acquisition of “usable economic wealth” with minimum tax, litigation, and business costs. Because DEQ fosters the industry, it is a captured agency — one that advances the concerns of the special interest group it is charged with regulating. Capture is normally frowned on and the captured regulators often deny it. But far from denying, the Michigan legislature is proud of it. The obvious first option for reversing it of course is political action and lobbying of elected decisionmakers. But with current officeholders there is little hope. On February 13 Governor Rick Snyder keynoted an all-day “Governor’s Summit on Extractive Industries” in East Lansing. MOGA announced the goal was to promote and showcase extraction companies. Over 200 attended. For legislators and staff, the $50/plate event and lunch were complimentary. Leading committee members of the House and Senate opened the meeting. It was co-sponsored by MOGA, whose chairman Joel Myler sat on the opening “extractive industries 101” panel. Harold Fitch, the assistant Supervisor of Wells, sat on the second panel. Attendees watched this video. Do you agree that production of oil and gas exacerbates global warming which can lead to world-wide catastrophe, and if so how do you square that with Michigan’s policy expressed in MCL 324.61502 that DEQ regulators are to ‘foster’ the oil-gas ‘favorably’ and ‘maximize’ oil-gas production? The more promising option is to call public attention to the fostering/maximizing issue and then for public action. The issue dovetails with the related issue of fracking — the modern version of what the Saginaw developers did with exploding nitroglycerine in the 1920s. Today the lion’s share of US climate-changing oil-gas production is developed with fracking completion methods, particularly in horizontal wells. Polls show majorities oppose fracking nationally and in Michigan both among local officials and voters. However, this earlier hydraulic fracturing was undertaken with vertical drilling only and relatively small volumes of water usage. More controversy has grown recently around the use of high-volume hydraulic fracturing, which uses horizontal drilling to expand the underground area that can produce gas or oil, but which also requires much higher volumes of water, and produces higher volumes of used “fracking fluid” mixtures that must be disposed of somewhere. All of these factors have raised potential health and environmental concerns. In Michigan, the issue of fracking has seen a marked increase in attention. Since 2015 the Committee to Ban Fracking in Michigan (CBFM) has undertaken a statewide ballot initiative to ban horizontal fracking and acidizing and their wastes. The initiative is known chiefly for that language. It would also include the substances involved in horizontal fracking in the definition of prohibited waste. The exact language is here. The initiative is motivated by public health and environmental concerns in addition to climate. It has long been the declared policy of this state to foster conservation of natural resources and to provide for the protection of the air, water, and other natural resources from pollution, impairment, and destruction. In past years extensive deposits of oil and gas have been discovered that have been extracted using wells through which oil or gas flowed naturally or was pumped to the surface. The recent uses of high intensity horizontal hydraulic fracturing and acid well stimulation and completion treatments are different and typically include injections of large amounts of water, solvents, acids, and other chemicals to fracture or dissolve underground formations horizontally, the consequences of which pollute, impair, and destroy our water resources, land, air, climate, and public health. The interests of the people demand that the exploration of oil and gas shall not be done at the expense of the natural environment and human health. It is accordingly the declared policy of the state to protect the interests of its people and environment during gas and oil development. This part is to be construed liberally to give effect to sound policies of conservation and the prevention of waste and exploitation, and to protect water resources, land, air, climate, human health, and the natural environment. The language would not change the subsections of Act 61 which declare unnecessary wells as “waste.” The statute would continue to provide for proration and drilling units. Unitization would not be affected. Nor would there be changes regarding compulsory/statutory pooling. The process would continue as before, with decisions based on owners each getting a “just and equitable share” of the oil or gas. The Supervisor could continue considering prevention of waste. The conservation and development of the natural resources of the state are hereby declared to be of paramount public concern in the interest of the health, safety and general welfare of the people. The legislature shall provide for the protection of the air, water and other natural resources of the state from pollution, impairment and destruction. This is apt, given that the Supervisor of Wells is the Department of Environmental Quality. More generally, a new view would replace the old one in all manner of DEQ judgments and decisions ranging far beyond compulsory pooling. Should the CBFM measure succeed, the governor could not veto it, nor could the legislature amend or repeal it except by a ¾ vote in both houses. By thinking globally and acting locally, Michigan will have made its own contribution to forestalling or preventing climate change. As mentioned above, IOGCC has 38 member states. Most or all of them have policies embedded in their statutes and regulations similar to Michigan’s “Construction of Part.” An article similar to this one could be written for each state, using sources arising in that state. Underlinings in quoted materials above are added. Footnotes in quoted materials are omitted except for the “in trust for the public” paragraph which was in a footnote of Ford’s, quoting another author. Donald H. Ford, Controlling the Production of Oil, 30 Michigan Law Review 1170, 1171-78, 1178-1201, 1202-06 (1932). Charles O. Galvin, Developing an Oil and Gas Jurisprudence in Michigan, 7 Wayne Law Review 403, 403 (1961). A scanned copy may be obtained from the WLR managing editor. Boice Gross, Michigan’s Legislation Governing Oil and Natural Gas, 10 Michigan State Bar Journal 193, 194 (1931). Jerome Maslowski, Government Regulations Many and Varied, 49 Michigan State Bar Journal 50, 50, 52 (1970). James R. Neal, Compulsory Pooling Promotes Conservation of Michigan’s Oil and Gas Natural Resources, 78 Michigan Bar Journal 158, 158, 161, 162, 163 (1999). William Reid Ralls, Oil and Gas Regulation: An Overview, 68 Michigan Bar Journal 14, 16, 17 (1989). James A. Veasey, The Law of Oil and Gas, 18 Michigan Law Review 445, 445 (1920). Photographer credits: unknown. The Clarke Library notes that almost all its photos were taken from the files of the Michigan Oil and Gas News (MOGN) or the private collections of two long-time editors of the MOGN, Norm Lyons and Jack Westbrook. On March 16 the Michigan court of appeals rejected an appeal of a FOIA information case brought by landowner Gary Cooley and Ban Michigan Fracking about a supposed “mineral well” in Crawford County. Though not questioning their standing, the court held plaintiffs had not stated a proper claim of right to information. D4-11, October 6, 2016. Photo: LuAnne Kozma. Plaintiffs had sought the environmental impact assessment (EIA) and other information about this well drilled in the state forest a mile from Cooley’s property in Beaver Creek Township. In 2015 Cooley, who opposes gas-oil development in the state forest, refused an offer to lease the gas, oil, and minerals under him. The offer included a signing bonus and a royalty interest. Typically the requested documents are voluminous, sometimes running to over 100 pages. In particular the EIA has information about water wells, wetlands, surface waters, endangered species, pad facilities, soil erosion, and disposal of fluids and brines at or near the wellhead. These are items of interest to any nearby landowner. 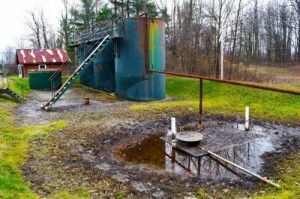 The applicant for the well was Marathon Oil, which owns nearly 1000 square miles of leases in Michigan under state land. The name of the well is “Beaver Creek D4-11,” or just “D4-11.” In June 2015 Marathon applied for a permit under “part 625,” the state’s law for mineral wells. DEQ granted the permit on an unknown date. The drill rig had seen service in oil-gas exploration in North Dakota a thousand miles away before coming to D4-11. The nearly-200-foot-tall rig must have cost Marathon millions to transport and operate. Marathon Oil is in the oil-gas business. In September a worker on the rig told a visitor, me, the company hoped to find gas or oil. A blowout preventer was left in place after the rig departed D4-11, a practice required only by the gas-oil rules, not the mineral well rules. An official DEQ brochure states there are no minerals anywhere in Crawford County. These and other facts indicated that D4-11 would be a gas-oil well, not a mineral well. Part 625 does not define “mineral.” But in ordinary English minerals are understood to be hard, crystalline, and inorganic, which gas and oil are not. Minerals are extracted by mining but gas and oil are extracted by drilling. And the idea of testing a mineral in a 4700-foot hole is ridiculous. I published a video and the story of the investigation here. DEQ rules for gas-oil wells prohibit nuisance noises, but the rules for mineral wells do not. And unlike for gas-oil wells, FOIA has a confidentiality period lasting 10 years for mineral well data including the permit and EIA. But legally it is the DEQ which has the burden of proof to show the exemption applies. DEQ answered the FOIA request by denying all information. Relying on the 10-year mineral exemption it refused to say even whether it had actually issued a permit. Marathon itself was similarly close-mouthed, except by email it did admit there was a permit. Plaintiffs sued in February 2016. In its responsive motion in May, DEQ finally admitted there was a permit. But it did not provide the date or a copy. Later that month I chanced on an article about the work of William Harrison of Western Michigan University, an author of 35 technical papers on Michigan geology. I decided to email him, outlining the theory of the FOIA case, and the evidence showing D4-11 is probably a gas-oil exploratory well not a mineral well. I invited him to view our video of the drill rig, said I would drop the case if D4-11 proved to be a legitimate mineral well, and asked him to respond. Wildcat exploratory wells for oil and gas have often been drilled under the State “Mineral well act” so that a company can gain information about the geologic deposits in that area with out releasing the information to the public and hence their competitors. I do not have any specific knowledge about the Marathon well you mentioned, but the area in Beaver Creek Township is a well-known oil and gas region with an old very large oil field there called the Beaver Creek Field. The Amherstberg formation is a known oil and gas producing zone in other parts of the state and is very likely the target zone they were evaluating. The naming of the well “Beaver Creek D4-11″ is also a very common naming style for oil and gas wells. As far as I know other mineral wells that are looking for solid minerals do not use this type of naming convention. In fact, oil and gas are considered “minerals” under the definition of that type of well. He was wrong because, unlike at the Department of Natural Resources, at DEQ there is a strict separation between mineral wells regulated under part 625, and gas-oil wells. The latter are regulated under part 615. As plaintiffs explained to the court later — in addition to highlighting the DEQ brochure which says there were no minerals in Crawford County — gas and oil are not considered “minerals” at the DEQ. Part 625 excludes gas and oil because gas and oil come under part 615. Even if the purpose of a well is only partially to explore for gas or oil, there must be a 615 permit. I asked if he would write me a separate letter affirming the opinion just expressed, that the Amherstburg is not a formation that contains solid minerals that could be produced commercially, and therefore he was “reasonably confident” that D4-11 was an exploratory well for oil and gas that was drilled as a mineral well to “maintain confidentiality.” I said this would likely suffice to win the case. I gave information about myself, and offered to pay his regular rates. I am not interested in any consulting work for you or your client. Translated: His practice is not to testify as an expert witness, not for anyone including the industry. I believe him but was surprised he wouldn’t repeat something in court that he had just told me, a stranger, for free. Later I realized how tied in he is to DEQ and the industry. Last June he joined DEQ’s industry-dominated oil and gas advisory committee. The committee, composed of the “stakeholders,” is supported by several DEQ staff. Last month the Michigan Oil & Gas News pictured him with his wife as “silver medal sponsors” of the annual petroleum conference of the Michigan Oil & Gas Association (MOGA) and Northern Michigan American Petroleum Institute. Surely everyone else on the DEQ advisory committee knows what he knows, that exploratory wells for gas and oil have “often” been drilled as mineral wells to get geologic information and then kept secret. Surely the rest of them know what he does not, that oil and gas are not DEQ-defined minerals and the oft-repeated claims of mineral well applicants — that their “purpose” is just to test “minerals” but not explore for gas and oil — are false. Harrison’s encouraging emails were not confidential. I would have been free without his permission to quote them and his credentials to the court. But I decided to respect his desire to stay out of it. As to the claim that D4-11 was not actually a mineral well, and therefore mineral well confidentiality should not apply, plaintiffs pointed out that the DEQ website links to the dozens of forms which it uses to question applicants for mineral wells. None of the forms asks the applicant whether the well will actually test a mineral. None of the forms asks the applicant to name the mineral it proposes to test. Plaintiffs have no facts to contend that DEQ and Marathon arranged a sweetheart deal to keep this particular well secret. Rather it appears from the 64 DEQ forms that it never asks any operator who is testing minerals known to be present –- as opposed to exploring to see whether they are present –- to demonstrate the point. If so, DEQ invites a train of abuse from industry operators desiring to maintain secrecy by falsely stating their objectives while not under oath. In other words, even if Mr. Cooley’s allegations of deception on the part of Marathon were factually meritorious … this alleged “deception” would not be illegal. to qualify as a mineral well the operator’s intent at the start can only be to explore for or test minerals. In this case the operator’s stated intent was not to explore for a mineral, but to test one…. But … the Marathon safety man’s expression of hope that the company would find gas or oil at D4-11 means in the most literal commonsense sense that the company was “exploring” for gas or oil. The court ruled on March 16. The unpublished opinion recited none of the facts indicating that D4-11 was actually a gas-oil well except it did acknowledge the claim that Marathon hoped D4-11 would find oil. The court also acknowledged that a plaintiff’s well-pleaded factual allegations have to be accepted as true at this stage, and DEQ had the burden to prove that any exemption for mineral wells under part 625 applied. At oral argument plaintiffs had noted Marathon’s hope that D4-11 would find oil was not a fact critical to the case, and based on all the other facts, the case would be just as valid had the rig worker not made that admission. The complaint and exhibits had shown that D4-11 would be a test well not an exploratory well, no minerals exist in Crawford County to even be tested, DEQ excludes gas and oil from its definition of “minerals,” DEQ relied solely on Marathon’s checkbox and did no independent investigation of minerals at D4-11, and the Amherstburg is a formation where Michigan oil prospectors have frequently looked. These facts showed “a good circumstantial case,” the brief said. But even if these facts were all true, the court held, the exemptions of part 625 still applied. The case ended. The decision amounts to a ruling that even if DEQ rightly should have processed D4-11 as a gas-oil well under part 615, the fact that it did process it as a mineral well under part 625 controls, and the exemptions to FOIA apply. What should a landowner do? Anyone can sit in on the quarterly meetings of the mentioned DEQ advisory committee, and minutes of past meetings are available on request. Just one of its eight members is from an environmental organization, and that one (Michigan United Conservation Club) has long accommodated the gas-oil industry. Its director recently left there to become director of MOGA. Since joining the committee Harrison has not brought to its attention the frequent industry practice of filing for a mineral well in cases where his expert opinion is that the operator’s purpose is really to explore for oil. Landowner Cooley’s court complaint only sought information. It did not seek to invalidate the permit. So in the future suppose some landowner notices an ugly new several-acre gash in the forest nearby and a big noisy drill rig going up. Suppose too the rig gives every indication it is exploring for gas or oil, but DEQ claims it is really a mineral well. Is there a remedy? Yes. One tack would be to just assert that a permit was issued and then sue to invalidate it. A Michigan statute allows such a suit in the court of claims. The gas-oil applicant would have to be named as a co-defendant. The statute has no requirement to exhaust administrative remedies before suing, and indeed how could a landowner try to exhaust given that all information was refused? The statute of limitations is a very short 21 days, but would not be a problem if DEQ refused the permit date. Circumstantial evidence can prove any case. Expert testimony such as what Harrison refused for D4-11 would likely be necessary, because unlike in a FOIA case the plaintiff would have the burden of proof. The burden would be satisfied simply by showing the “purpose” of the well, at least in part, is more likely than not to explore for gas or oil. Litigation isn’t the only way. Instead the landowner could find someone knowledgeable in the academic world, and then publicize the well. Surely experts are there who would be willing to shame a practice which sacrifices landowners and the environment to profit-driven competitive gas-oil interests. Surely someone would be willing to speak up. 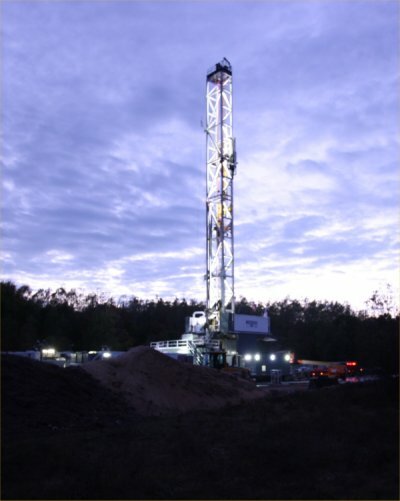 A nearby, producing well also owned by Arbor Operating, Swanson 5-7, in Johnstown Township in Barry County. Photo by Jackie Schmitz. Residents in Barry County are preparing for a public hearing held by the Environmental Protection Agency (EPA) for a proposed underground injection well in Johnstown Township. 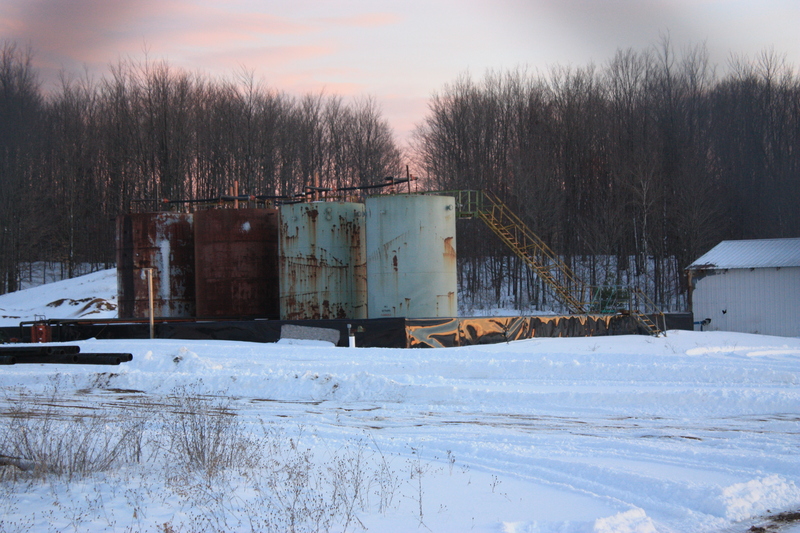 A Traverse City-based company, Arbor Operating, seeks to operate a class 2 well, Swanson 4-7 SWD, which would take toxic wastes from oil and gas wells for permanent disposal. The permit application is requesting for a dry oil well on Manning Road to be converted to an injection well. 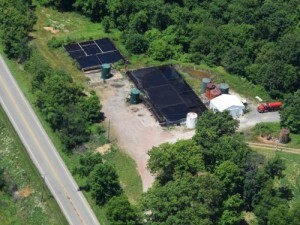 The company now brings its wastes from three oil/gas wells to Calhoun County for disposal. Diagram of an underground injection well for oil and gas industry wastes. EPA illustration, in the public domain. 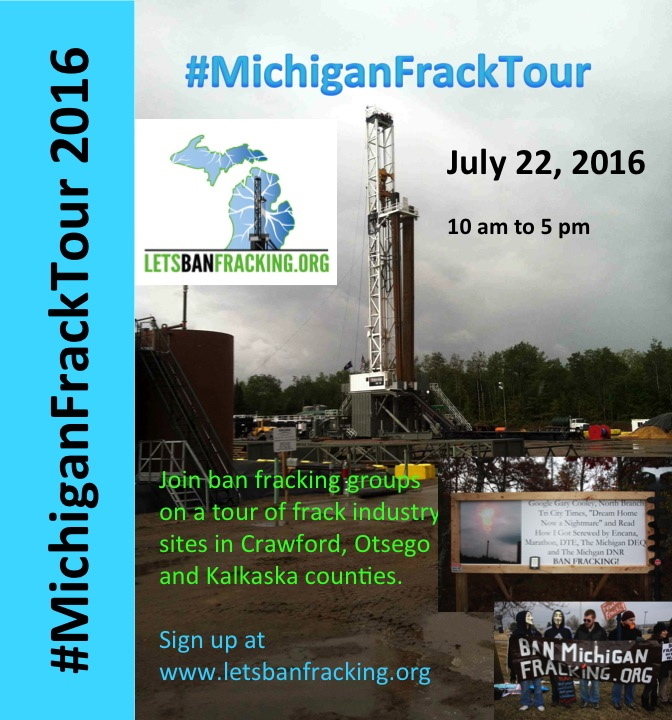 Anyone concerned about injection wells in Michigan are welcome to attend and provide comments to the EPA. The hearing is preceded by a public informational meeting. Both take place at the Hastings Public Library. If you cannot attend, please send written comments. Come early to register to speak and be prepared to give a 3-minute comment. See the EPA Public Notice here. “State, EPA say proposed brine disposal well in Barry County is safe” MLive, April 13, 2017. 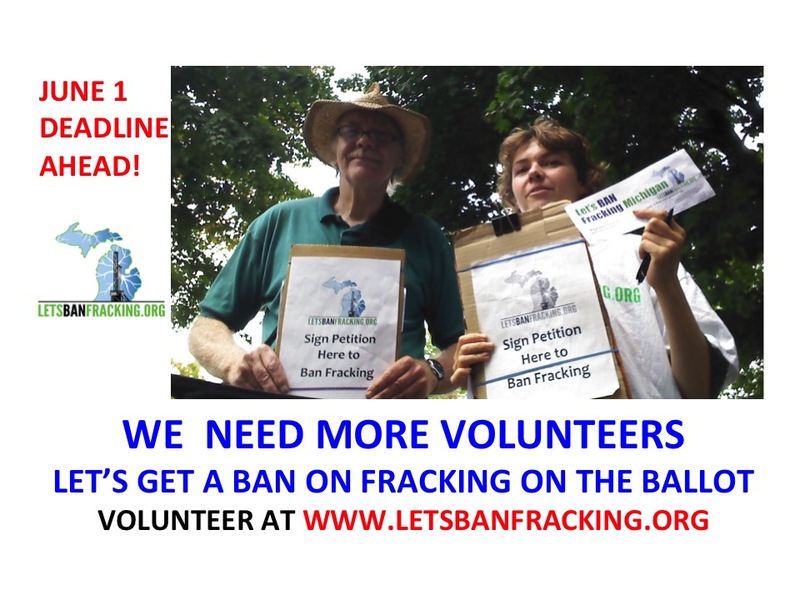 To get a ban on fracking and frack wastes on the November 2016 ballot, the Committee to Ban Fracking in Michigan needs more people to help collect signatures. If you haven’t been involved, now is the time. It’s urgent. We’ve got a state to protect! The deadline for collecting all the signatures is end of May 2016. Over 150,000 people signed the petition last year. We were at as many festivals, farmers markets, concerts, and street corners as we could last spring, summer and fall. Nearly 800 people were involved. We were everywhere! We met enthusiastic supporters from every county in the state. At our press conference in November 2015 with our 150,000 signatures.We are a true grassroots campaign. We are a true grassroots campaign. 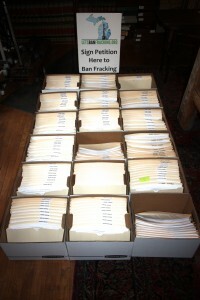 Last year, 100 volunteers collected over 92,000 signatures. Another 659 volunteers collected nearly 43,000 signatures. Paid circulators collected an additional 16,000. The signatures collected last year have been verified using the Qualified Voter File. We plan to use all of the valid signatures in the submittal. While there is a Legislative effort to stop us through Senate Bill 776, (currently in the House Elections Committee), if passed, it will only force us into court. But without enough signatures to submit, we can’t continue the fight. We’re not at the 252,523 valid signature mark yet. During the long winter, many people dropped out, for various reasons: ill health, family obligations, moving out of state, etc. The bottom line is, we need NEW people to step up and participate. It’s not hard collecting signatures. Standing outside talking to people, asking them to sign, can take as little as one hour to collect 25 signatures. Outside a busy coffee shop in a northern Michigan city last Saturday, it was cold but sunny, and I was able to collect signatures from 30 people in just 1 and a half hours. It’s that easy. And we hear spring is on its way! We need volunteers to collect more than just a few signatures, because it’s difficult for the team of organizers to take the time to train thousands of people who do only a handful–we’re volunteers too, and time is very limited to get this done. So please. If you want to see this proposal on the ballot . . . Step up. Sign up. Collect signatures. There’s no magic bullet, no magical group of people that will swoop in and do it for us. When you sign up, we’ll teach you how to fill out the sheets property, give you official petitions and a clipboard, mentor you, and get you started. We’ve come this far. Let’s get all the signatures we need. Don’t assume that others will do it for you. And Spring events are upon us! Collect signatures at flower sales, craft fairs, sport events, races and runs, food fests, concerts, busy sidewalks, Arbor Day, Earth Day, Mothers Day . . . and more. If you cannot physically volunteer to collect signatures, please DONATE to the campaign to hire some individuals and teams to help out the volunteer effort. Let’s Ban Fracking and protect Michigan from the many harms of fracking. See the campaign brochure here. LuAnne Kozma is the campaign director of the Committee to Ban Fracking in Michigan, and also the president of the non-profit group, Ban Michigan Fracking.